Niagara Falls er et tordende testamente mot naturens kraft, og faller opp til 167 meter (51 meter) høyt. 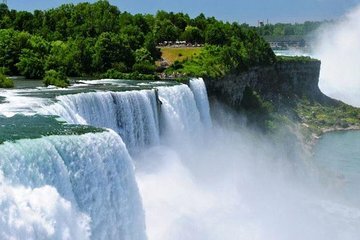 Mens det kan ta syv timer å reise på vei til fossen fra New York City, reduserer denne turen reisetiden med flybillett og en lokal overføring fra Manhattan-hotellet, slik at du enkelt kan se flere Niagara-høydepunkter på en enkelt dag. Great experience - the Falls are breathtaking - well worth the trip. It was an amazing tour. Highly recommended. I can't even put into words how special this day was! My husband and I enjoyed every minute of this experience and would LOVE to do this again! Immer wieder gerne. Diese Tour war wunderbar, der Reiseleiter sehr sympatisch. A great tour, a great day. This was breathtaking...we visited Niagara Falls on one of the coldest days it has seen for some time. The tour was arranged very very well, when you consider the transport involved planes and buses, and hotels etc. Our day started at 5:45am and we got back to the hotel that night at about 9:00pm, so a very long day but very worth it. This is just one of those things that you just HAVE to do.